The 4 room school building addition at Promise Primary is progressing on. The walls have been laid to the height which defines the top of the doors and windows. The next step is pouring the steel reinforced concrete “Ring Beam” layer that supports the weight of the walls above this point. The pillars for the porch overhang are also being poured. 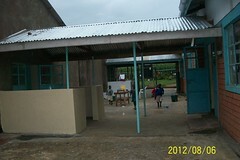 All of the balance of needed materials have been funded and are being accumulated on site. This must be very exciting for the kids currently in school and community. It is a prayer being answered before their eyes. Here are some photos….